Remember when I made Butternut Squash Ravioli and I hand rolled the pasta? It was so good that my husband was inspired to make sure Santa brought me a pasta maker on Christmas morning...resulting from the threat that we would never eat this dish again if I didn't have a machine to roll the dough for me...long story short...Santa delivered! Well I finally made Butternut Squash Ravioli again and it was even more delicious with "machine rolled", aka, thin rolled pasta. And my arms didn't ache for days afterwords. I highly, highly recommend a pasta machine for all pasta lovers everywhere!! Needless to say, we are now hooked on homemade ravioli. So I've been doing some experimenting and came up with this gem of a recipe. 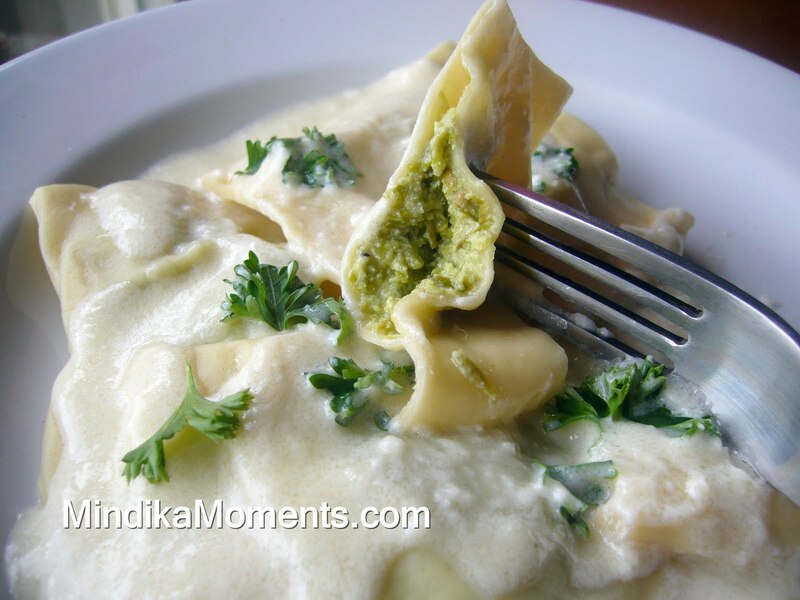 Roasted Asparagus Ravioli is a new fav around here! But I'm not naive and I know that most people haven't taken the crazy plunge into Pasta Machine ownership, and as good as it is...hand rolling is just too much work. So I've given a non-ravioli option to this recipe. All the same flavors, much easier preparation. I hope you'll give it a try...ravioli or pasta version! Enjoy!! 1. Preheat the oven to 450 degrees. Spray at baking sheet with cooking spray. 2. Toss the asparagus with olive oil and arrange in a single layer on prepared baking sheet. 3. Sprinkle with zest, juice, pine nuts and salt & pepper. Place the garlic cloves anywhere on the baking sheet. 4. Bake for 10-15 minutes or until the asparagus is fork tender. 6. Place in a food processor or blender along with the Parmesan cheese and cream. Pulse or blend until a thick paste forms. 1. In a medium sauce pan, melt the butter over medium heat. 2. Add the cream and bring to a simmer. 3. Add the cheese and stir until melted. 1. In a mixing bowl, combine all ingredients. Mix until a dough forms. 2. Kneed several minutes until the dough is well combined. 3. Cover with plastic wrap and allow to rest for 20-30 minutes. 4. Using a pasty machine, roll out and cut. 2. Spoon 1 T. dollops of the Asparagus Pesto onto one of the pasta sheets, spacing about 1 ½ to 2 inches apart. 4. Pinch the edges of each ravioli. 5. Boil in salted water for 3-4 minutes or until the pasta is aldente. 6. Serve with Alfredo sauce. 1. Toss the hot cooked pasta with the Asparagus Pesto and Chicken. 2. Right before serving, top with some Alfredo Sauce. Hey Mindi! I've been reading your blog for awhile but never commented at all. You are amazing, woman! You do it all! Marketing maven, fashionista, Supermom and Queen of the kitchen...really, its just not fair for someone to have as much talent as you. =) I'm not a talented cook at ALL so I'll have to try out your recipes! Just made fried ravioli for my family. I plan to post it tomorrow! Fried Ravioli...yumm! Can't wait to see the recipe. Thanks Darci! You make me sound amazing...I'm not really that amazing. Just trying my best at life. There are many many things I can't do, that I'm sure you can. But thanks for the compliment and for reading my blog. This recipe looks amazing. I've printed it out and hope to take it for a spin soon.